Diabetes is a condition in which sugar is not properly absorbed by the body. Both type 1 and type 2 diabetes share one central feature: elevated blood sugar (glucose) levels due to insufficiencies of insulin, a hormone produced by the pancreas. Globally the incidence of diabetes is expected to exceed 250 million people by 2025 – resulting in 35 million heart attacks, 13 million strokes, 6 million episodes of renal failure, 8 million instances of blindness or eye surgery, 2 million amputations and 62 million deaths –that is a measure of the scale of the problem. While diabetes belongs at the top of the healthcare agenda, it has yet to be given that position. Most doctors believe that diabetes is incurable… that’s what they’ve been taught. The best you could hope for – according to what they learned in medical school – is to “control” this disease with medication and insulin. And they’re right… Diabetes is incurable if you follow most doctors’ advice of merely suppressing your diabetes symptoms with pharmaceutical drugs. While prescriptive medications can help you “artificially control” your blood sugar, they do nothing to get at the root cause of the disease. As we all know, prescription drugs (hypoglycemics) simply mask symptoms. They do not cure; actually they exacerbate the problem as they weaken your immune system. What is meant to help you out only make matters worse. Sadly, diabetics taking drugs are 2.5 times more likely to die from heart disease than those treated by diet alone. And again, then there are the side effects of medication. These include liver problems (jaundice), anemia, skin rashes and sometimes, death. Both oral anti-diabetes drugs and insulin are not health-friendly options. They hasten the onset of aging, and damage your liver, heart and other organs among other complications. But there is a solution. Diabetes is curable. However, it is not cured by treating symptoms with drugs that only perpetuate the condition. Please understand, prescription drugs are the largest orchestrated fraud in human history. The solution is to address the root cause of diabetes by stimulating your body to restore your pancreas and naturally produce more insulin, without the complications or side-effects of drugs and medications. Why don’t we hear about this information from the American Diabetes Association? The truth is, the American Diabetes Association are benefiting hugely from the current trend in diabetes. They are funded by pharmaceutical companies who would lose out if people reversed there diabetic conditions. But the truth is that reversing diabetes is not only possible, it is likely if you are willing to put forth the effort and follow some simple, proven steps. 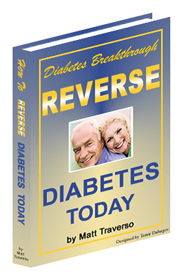 Everyday now more and more diabetics are finding that they can literally reverse this disease.